Looking for a high-protein alternative to French fries, or want a healthy snack your vegetarian or vegan kids will actually eat? Try this cornmeal breaded fried tempeh recipe for a vegetarian and vegan snack or finger food perfect for kids, Superbowl snacking or anytime you want something more than a carrot to dip into ranch dressing. 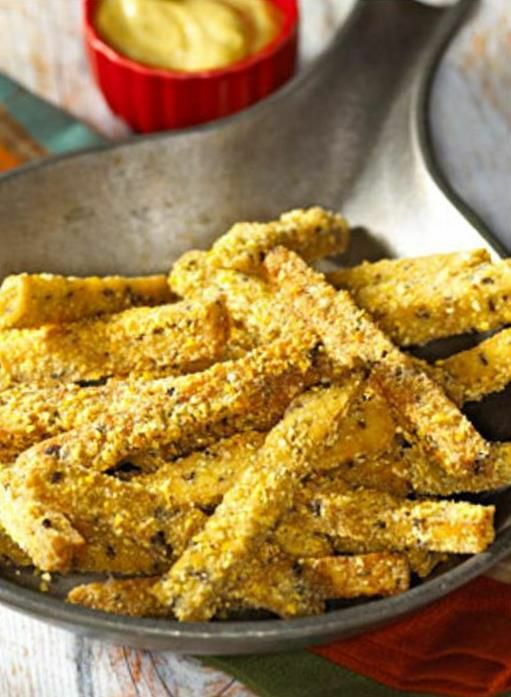 In this easy tempeh fries recipe, tempeh is breaded and lightly fried for a crunchy high-protein alternative to French-fries for a healthy vegetarians and vegans dish - and particularly great for kids! This recipe suggests dipping your fried tempeh sticks in a vegan curry-mayonnaise sauce, but you could also try these with ketchup, soy sauce, ranch dressing or even barbecue sauce. I also really like a sweet Thai chili sauce for dipping. Like tempeh? Here's more vegetarian tempeh recipes to try. First, slice the tempeh lengthwise to make "French fry" shapes, about 1/4-inch thick sticks. In a large skillet, bring about an inch of water or vegetable broth to a boil. Working in batches if needed, simmer the tempeh, covered, for 10 minutes, then drain well. This step is needed to pre-cook the tempeh. Combine the cornmeal and salt in a small or medium-sized bowl. While the tempeh is still moist, roll each stick well in the cornmeal and salt mixture. In a large skillet, heat the vegetable or canola oil over medium-high heat. Working in batches as needed, sauté the cornmeal-coated tempeh for 2 minutes on each side or until lightly golden brown. Drain each tempeh fry on a paper towel. To make your curry mayonnaise sauce, whisk together the mayonnaise and curry powder in a small bowl, and dip your tempeh fries in this curried mayonnaise dip. Enjoy! Not a fan of curried mayonnaise? Try dipping your tempeh fries in ketchup, a bit of hot sauce (who doesn't love Sriracha sauce?) barbecue sauce, Thai chili sauce, or maybe even homemade hummus. I also like a nice honey mustard. Looking for more high-protein vegetarian and vegan meal ideas? First, check out some great ideas for where to get protein on a vegetarian or vegan diet, then check out these high protein meal ideas.